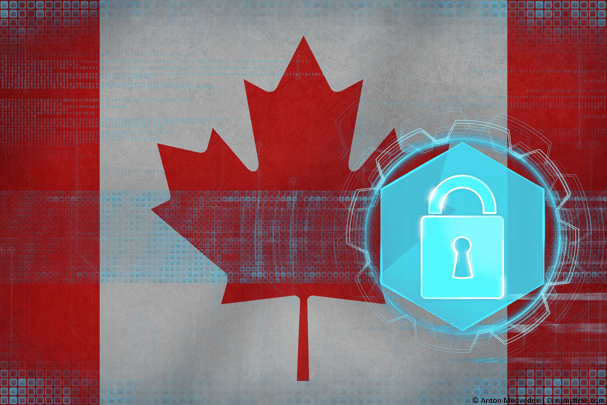 Choosing a VPN service for Canada is much like choosing a VPN service for any other country, although there are some specific considerations. In this guide we’re taking a look at the Top 5 VPN services for use in Canada which offer a better quality of service, more servers and faster speeds, particularly for Canadian users. We’ve tested more VPN services than we care to remember so you don’t have to. That’s no easy task with more than 1000 commercial VPN services in existence we’ve whittled it down to five of the most suitable for Canada. Our favourite VPN for use in Canada is definitely IPVanish because they offer just slightly more than the competition. Below are our Top 5 choices though and any of these will help you get protected and secure in Canada. IPVanish offers a VPN service that simply works and not only does it work, but it works well. This popular no-fuss VPN service works across all major devices including Android, iOS, Windows and Mac. There’s even an app for the Amazon Fire TV and Fire TV Stick which is great for protecting your Kodi watching habits. Speeds on the service are generally above average and torrent access is allowed so if you download a lot then you’ll really appreciate the speeds. There are three locations across Canada in Toronto, Vancouver and Montreal plus more across the border in the US and further afield across 60 countries. 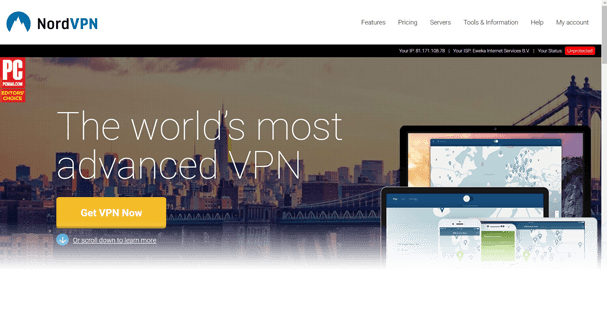 NordVPN has become one of the number one VPN providers in the world and it’s not hard to see why. With servers in over 59 countries, there is plenty of choice for connection. There are 195 servers across Canada alone with special servers for P2P, Anti-DDoS, Double-Hop and Obfuscated Servers. The apps which are available for all major devices are very simple to use. Just select a location on the map, click it and get connected. You’re now safe and free to browse the web securely. If you’re concerned about how difficult the service will be to use or if it’ll be suitable for your needs in Canada then the 30-day money back guarantee will put your mind at rest. Having a full month to test the service is definitely a bonus. ExpressVPN certainly live up to their name offering some of the best speeds in the industry so if you’re looking for a fast VPN service in Canada you can’t go wrong here. This large VPN service offers more server locations than most other VPN providers in more than 90 countries across the world. If accessing blocked content and TV is your interest then there really isn’t a country ExpressVPN doesn’t support. Canadian servers are available in Toronto, Montreal and Vancouver. They also have a huge range of apps for all the most popular devices plus Amazon Fire TV and Fire TV Stick, Linux and a range of routers too. The service is registered off-shore in the British Virgin Islands and there are no requirements to store activity or connection logs so what you access remains private. CyberGhost VPN is another popular provider not only in Canada due to the ease of use of their service and the simplicity of their apps. The service is one of the easiest to use because it helps you get connected to the correct server for your needs. This is broken down into easily understandable options. If you need more choice though you can connect directly by country. There are VPN servers in more than 59 countries across the world including three different locations in Canada including Toronto, Vancouver and Montreal. While the prices for the 1-year package are cheap enough, if you’re prepared to sign up for 2 or 3 years you can get an even better deal and one of the cheapest prices per month in the VPN industry. If all that wasn’t enough then there’s a lengthy 30-day money back guarantee that lets you test the service risk free. Advanced users love VPN.ac for their extra privacy provisions and advanced encryption options. If you’re a user who loves to tinker around with features, especially encryption then this is the service for you. Canadian servers are available in both Toronto and Montreal plus there are additional locations running along the border with the US in New York, Chicago and Seattle. The service offers some of the fastest speeds we’ve seen which will allow you to connect and forget about the service. Speeds are that good that you won’t even know you’re connected to a VPN. Although the service will suit advanced users the recently redesigned apps are also easy enough to use if you’re a beginner. With apps for Android, iOS, Windows, Mac OS and Fire Stick you can use the service across a wide range of devices. If you’ve already started searching for VPN services to use in Canada before reading this guide then you’ll know it can be extremely difficult. There are so many VPN services out there how can you even begin to know which are good, which are bad and more importantly which are most suitable for use in Canada? It’s most important to consult up to date guides for the year you’re looking for a VPN. VPN services can change in quality regularly and a provider that was top in 2017 may not still be the top in 2018. For that reason, you want to consult guides such as this one that is up to date. As you’ll already be aware Canada has a huge landmass and when using VPN servers the physical distance can massively impact on the speeds you’ll receive. If you live in Toronto or the eastern side of Canada this often isn’t an issue because most VPN services have servers in the area and if not you can guarantee there’ll be a server in nearby New York. If you happen to live in BC or Alberta then you’ll need to look for a VPN service that offers a VPN server in Vancouver or at the very least in the Seattle area in the US. Often how long you subscribe to a VPN service depends on your purpose for using a VPN. If privacy protection or accessing geo-blocked content on a regular basis is your main concern then subscribing for the longest length of time will be best. The largest savings can be made when subscribing for a year or more and can regularly be 50% or cheaper than if paying on a monthly basis. Some VPN services do offer subscription periods longer than a year and the price is even cheaper. However, it’s worth remembering that the quality of VPN services can change and subscribing for any more than a year brings with it an increased risk. If the service quality deteriorates then you could be left with a service that you’re no longer happy with. We recommend subscribing for 1-year because it offers the best combination of cheap prices and low risk. Yes, certainly. As well as a VPN being able to protect your online privacy it will also allow you to change your location. When you change your location you’re often able to access TV services from other countries and stream them directly in Canada. For example with a VPN service such as NordVPN you’re able to access the US Netflix catalogue. If you’ve got a Canadian Netflix account then you can simply connect to the US and access a larger range of movies and TV Shows. Accessing TV content isn’t just limited to paid-for services, you can also access free-to-air content such as BBC iPlayer from the UK or 7Plus from Australia. Yes, this is entirely possible. All five of the recommended providers above allow you to use one account on up to 5 – 6 devices at the same time. They all supply apps for Android and iOS mobiles and tablets and software for Windows and Mac OS computers. You can install the apps and software on as many devices as you want to connect concurrently on between 5 – 6 devices depending on the limit of the provider you signed up to. This allows you to protect your mobile devices on either public Wi-Fi or mobile data and also on your home internet connection. We know choosing a VPN service in 2018 for Canada can be time consuming, costly and generally a headache. We tested a whole range of the most popular VPN services and a few lesser known ones to bring you this guide. We’ve done the hard work so you don’t have to. If you’re looking for a decent VPN service for use in Canada then we recommend IPVanish, they just ever so slightly pipped the other providers to the post. However, if you want to look around then the five providers above are our top choices when it comes to using a VPN in Canada. All you really need to do is choose one and sign up.